For some of us it seems hard to believe but the Masters Tournament this year is the 50th since Jack Nicklaus won his first of six green jackets. Of course in addition to the half dozen Masters wins he also took 12 other major championships in a career that defined golf in the 1960s and 70s and perhaps for all time. Artist Walt Spitzmiller is commemorating the Golf Bear’s achievement with the publishing of a fine art portfolio book entitled Jack’s Majors. The luxurious hand bound volume of 18 giclee prints, one for each major, is limited to 100 numbered editions. All are signed by Nicklaus and Spitzmiller and the prints have accompanying text by award-winning golf journalist Don Wade recounting the excitement of each tournament. 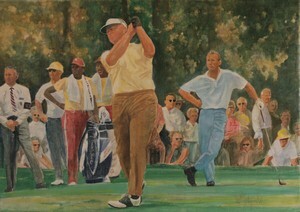 Spitzmiller topics cover all sports but he is especially well known for his golf paintings and they are widely held by private and corporate collectors, including Jack Nicklaus, Arnold Palmer, Tom Watson and Lee Trevino, as well as the PGA Tour. 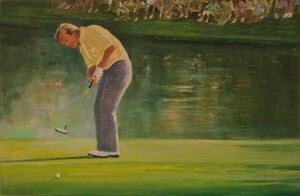 His art regularly illustrated stories in several national golf magazines and his paintings are hung in the World Golf Hall of Fame, Baseball Hall of Fame, The Smithsonian Institute, The American Museum of Illustration and the Rodeo Hall of Fame. Information about the limited edition Jack’s Majors and the 18 paintings in the collection may be found at www.jacksmajors.com.